Dylan Gilsdorf of Swanton drives to the basket for two points against Evergreen on Friday. Swanton’s Randy Slink blocks a shot by Chandler Lumbrezer of Evergreen on Friday. Josh Vance of Swanton shoots over Bryce Hudik on Friday. Swanton’s Andrew Thornton puts up a shot against Evergreen. 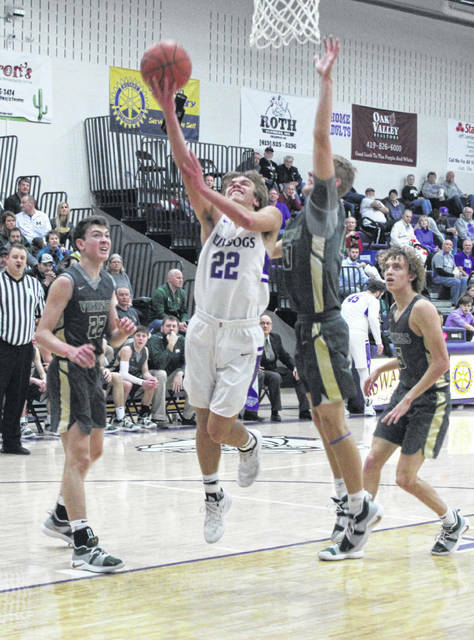 Swanton played a near perfect game against Evergreen Friday night in boys basketball. They swarmed the post, allowing Nate Brighton and Mason Loeffler just 12 points between them. Then offensively the Bulldogs committed a microscopic three, yes that is three, turnovers the entire night. Swanton allowed the Vikings just five first half field goals and led for over 30 minutes in the game. 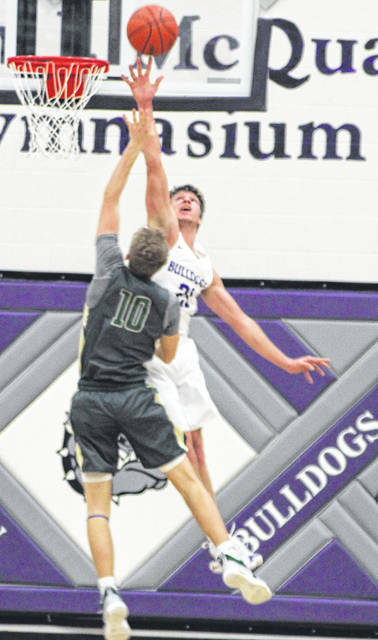 But in the end it was Chandler Lumbrezer making the biggest play of the night with a go-ahead, putback score with 14.2 seconds left, and Evergreen held on for a 45-44 Northwest Ohio Athletic League win over the stubborn Bulldogs. “Thank God he got off the bus with us,” Viking coach Jerry Keifer quipped after regarding Lumbrezer. “Because no one else could throw it in the ocean if they were standing on the beach. Randy Slink’s power move in the key broke a 7-7 tie with 31 seconds left in the first quarter to put Swanton up after eight minutes. Bryce Hudik’s triple 20 ticks into the second gave Evergreen a one point lead, but that advantage held for only 70 seconds when Jared Wilson regained the lead for the Bulldogs and began a 10-0 run. Andrew Thornton scored twice, Slink registered the same strong move inside for a score, and Josh Vance capped the burst with a bucket to give Swanton a 19-10 lead with 2:05 left in the half. 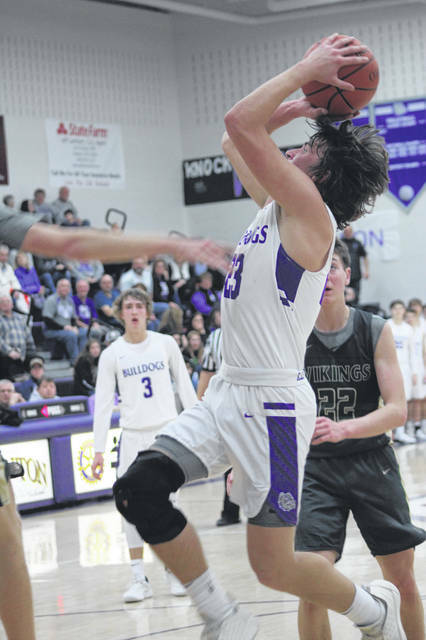 Meanwhile, the Vikings were building Trump’s wall, going 1 for 11 in the last 7:40 of the quarter with Nic Borojevich’s triple being the only basket as Swanton went into the half up 21-13. However, at the beginning of the third quarter Lumbrezer went to work, accounting for every Viking field goal in the quarter. The senior forward found Hudik cutting the rim for two buckets, Brighton for two more and scored on an out-of-bounds play himself to slice the Bulldog advantage to 28-25 before Thornton scored off the offensive glass to extend the Swanton lead to 30-25 after the third. Borojevich’s fourth quarter opening three-ball was countered by one from Slink before Lumbrezer struck again, this time with a three-pointer of his own, followed by two Hudik free throws to bring Evergreen even at 33 with 5:42 left. That began a trade of scores until Vance broke a 38-all tie inside with 3:15 left. When Wilson scored at the 2:05 mark off the weave, Swanton was up 42-38. Again it was Lumbrezer finding Hudik on a back cut for a basket and then knocking down a pair from the stripe to knot the score with 1:19 on the clock. Swanton, working for an open look, got one in the form of Dylan Gilsdorf who drew a foul with 28.4 to go. 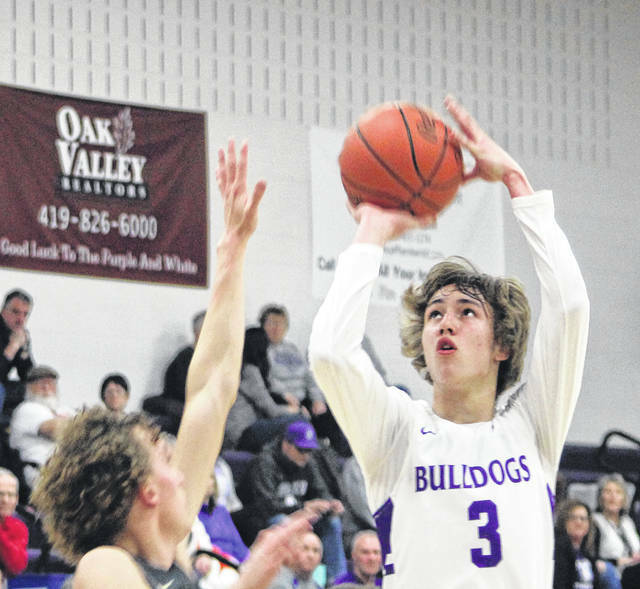 The Bulldogs’ senior point guard missed the first but put Swanton ahead by canning the second. Evergreen got a contested look from Hudik that rimmed out, but Lumbrezer scooped the rebound, scored and was fouled with 14.2 on the clock, giving Evergreen their first lead since the beginning of the second quarter. Lumbrezer missed but Loeffler came up with a huge play, out-fighting a Bulldog for the rebound and was fouled with 10 ticks left. The Viking junior split the pair for a 45-43, giving the Bulldogs a last shot to tie or win. Slink ended up with a loose ball with short time left and drew a hotly contested foul call on a shot block, giving Swanton a chance for a tie with 1.9 to go. Slink hit all net on the first but drew back iron on the second, and when Hudik snared the rebound, Evergreen had survived to raise their record to 11-1 and 2-0 in the NWOAL. “I have to give all the credit in the world to Swanton,” explained Keifer. “They came in with a great game plan. They were outstanding both defensively and offensively. They caught us on our heels a little, and that’s all a credit to coach (Joel) Visser and the kids. They played their hearts out and it’s sad to see them lose, they played that hard. After going a miserable 5 for 25 in the first half, Evergreen heated up in the second, shooting 11 for 17 in the second for 63 percent. Swanton shot 18 for 45 for the game, but only 8 for 21 in the second half. The Vikings out-worked the Bulldogs on the glass, 33-19. Lumbrezer led Viking scorers with 16, and added 12 rebounds and six assists. Hudik also hit double figures with 11 points. Slink paced Swanton, now 5-7 and 0-2 in the league, with 16. Thornton chipped in with 12. Evergreen travels to Lenawee Christian Tuesday and then treks to Delta on Friday for a league matchup. Swanton hosts Fayette Tuesday before going to Patrick Henry Friday in NWOAL play.